Multidisciplinary shows from different companies , as an artist. This show is one of the most incredible things that has happened in my life. For more info Click here. My first street theater show with which I worked internationally . ” L’ Amagatll Somnis ” (2011/13): Contemporary circus show, with Alex Bordanova and Victor Garmendia. “The Dreamers ” (2008 /11): Clubs passing and movement act with Victor Garmendia. “A favor… hasta de estar en contra” (2008 /13): Street Theater Show with Victor Garmendia. Comedy Clubs Passing Act with Sebastien Valade . London The Show: Multidisciplinary show that spread the emotions of life in London. Instant Acts: Artists from around the world performing in prisons and underprivilaged populations aiding in the fight against racism. Circus Rocks: Circus Show based around amusing pre-historic themes. Skype advertising campaign in all 5 continents. I was the image for Europe, I realized my artistic interventions in Barcelona. Short projects that I have enjoyed many great moments. PerrAkos SoundSystem (2013/14 SPAIN): Dj ‘s Comedy Set, with Suso Imbernon. The Flavinsky Brothers (GERMANY 2011 ): Live music and circus with Björn Sauer. The BarStars (2013 UK): Bottle manipulation act with Raul Garcia. Missing You (2005 UK) : Handstands, acrobalance and dance with Azucena Fabri. 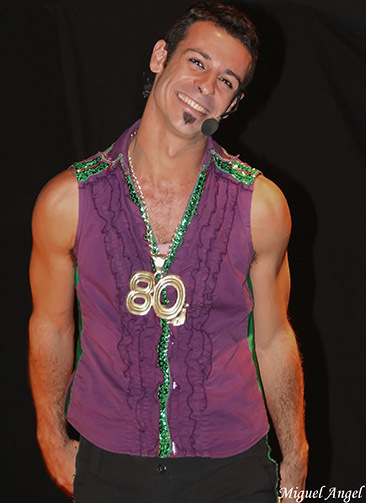 I started my circus career with Titola Teatre, Alborke Circ, Asociacion Monfeli. I am very grateful to them for introducing me to this wonderful world.